How to Fix: Missing File Privileges error in Steam. Method 1. Start Steam as Administrator. 2. Right click on Steam shortcut and choose Run As Administrator. Method 2. End the igfxEM Module process. 2. Press Ctrl + Alt + Del and open Task Manager. 3. At Processes * tab, right at igfxEM Module and click End Task. * Note for Windows 10: If you don't see the 'Process' tab, click More Details. 5. Launch Steam and retry to download/install the game. Method 3. Delete all files in Steam "downloading" folder. a. Press the Windows + R keys to open the run command box. b. Type msconfig and press Enter. 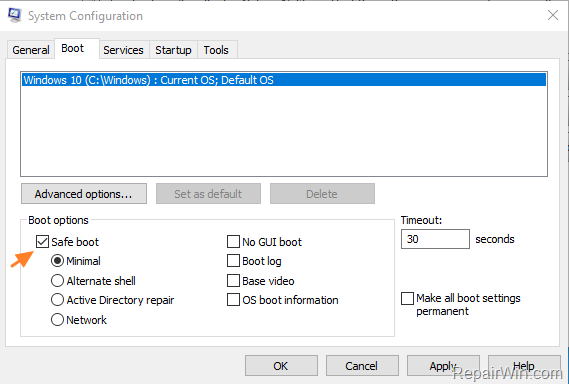 c. At Boot tab select the Safe Boot option, then click OK and restart your computer. 3. Delete all the files and folders inside the 'downloading' folder. 4. 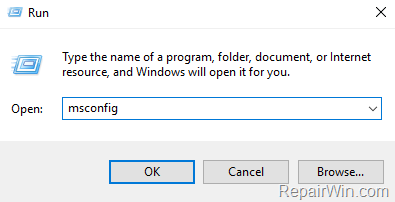 Open the 'System Configuration' (msconifg) utility again. 4a. At General Tab click the Normal Startup and click OK.
6. After restart try to install the Steam game. Method 4. Repair Steam Library Folder. 1. Open Steam and go to Settings. 2. Select Downloads on the left pane and then click on Steam Library Folders at the right. Method 5. Fix Permissions on the STEAM folder. 1. Navigate to C:\Program Files(x86) folder. 2. Right click on Steam folder and select Properties. 3. At Security tab, click Advanced. 5. Type your account name and click OK.
6. Check the Replace owner on subcontainers and objects and click OK.
7. Click OK twice to close all windows. 8. Reopen the Advanced security settings for Steam. 9. Make sure that the first 2 items on the list (Users & SYSTEM) has Full Control Permissions. If they haven't, click the Edit button and assign Full Control access to both items and click OK 3 times to close all windows. 10. Try to install your Steam game. 1. Temporarily disable or uninstall the Antivirus/Security software. « FIX: Cannot Change Theme – Aero Themes Greyed Out in Windows 7 (Solved)	» How to Change Outlook Password (Outlook 365, 2016, 2013, 2010 or 2007).